Saint Simon is named the "Zealot", to distinguish him from Saint Peter ( who was also known as Simon). It is said that the name "Zealot" was given to him because he was a member of a Jewish group named Zealots. It is supposed that he was martyred in Persia. 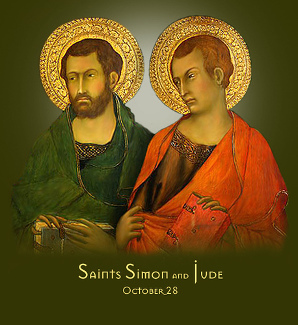 Saint Jude, known as Thaddeus, was a brother of Saint James the Less. He preached the Gospel in Judea, Samaria, Idumaea , Syria, Mesopotamia and Libya. He is the author of an epistle to the Churches of the East, directed against certain heresies which were then in vogue. He is said to have been martyred in Armenia.